Stephen Colbert’s best science segments: Will his move to CBS dumb down his guest list? Will he be stuck interviewing dingbat celebrities at CBS? 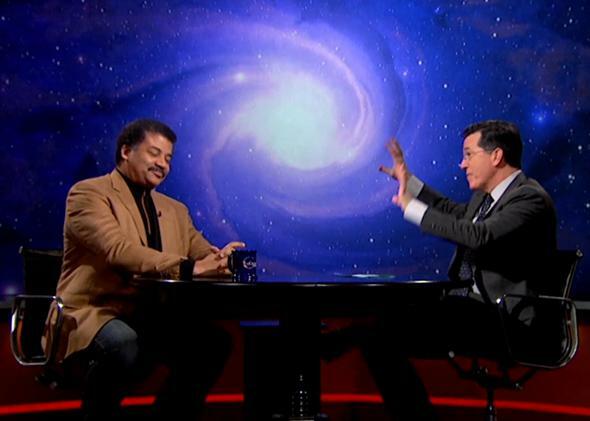 Stephen Colbert interviews astrophysicist Neil deGrasse Tyson on The Colbert Report. David Letterman announced last week that he will soon be retiring from The Late Show after hosting for more than 30 years, and CBS has confirmed that Stephen Colbert will replace him. While switching from The Colbert Report to The Late Show will be a huge career advancement for the comedian and TV show host, it could be a big loss for television coverage of science. This could change when Colbert takes over The Late Show. As Mashable noted, “the Late Show gig would force him to shoot the breeze with all manner of celebrities.” During Letterman’s run, Late Show guests have typically been movie or TV stars. For example, this week’s guests include Tom Selleck, Zach Braff, Lindsay Lohan, Rob Lowe, and Jason Bateman. Colbert Report guests this week include mathematician Edward Frenkel and primatologist Jane Goodall. Colbert’s transition comes at a terrible time for coverage of science. “Traditional science journalism has been gutted in recent years due to the economic downturn,” says Sheril Kirshenbaum, the co-author of Unscientific America: How Scientific Illiteracy Threatens Our Future. Paul Raeburn, chief media critic at the Knight Science Journalism at MIT Tracker, agrees. “Television news has jettisoned its science reporters in recent years, and when it does cover science it covers it like politics—who’s winning, who’s losing, and what does it all mean for the next election,” Raeburn said. The consequences were clear most recently in CNN’s horrifically bad coverage of the missing Malaysia Airlines Flight MH370. CNN cut its science, technology, and environment team in 2008. When host Don Lemon was covering the lost plane, he speculated on air that there could be some supernatural explanation, or perhaps the airliner could have disappeared into a black hole. Meanwhile, Animal Planet is airing fake documentaries about mermaids. Print media isn’t much better off: A Pew Project for Excellence in Journalism study showed that almost 100 major newspapers had science sections a few decades ago, and only 35 did by 2008. Colbert can’t cure public science illiteracy associated with declining news coverage, but by presenting scientific information to his huge audience in a fun and entertaining way, he has certainly helped. “Most Americans don’t know a scientist personally, so they get their impressions of who we are and what we do via television and film,” says Kirshenbaum. Colbert features science in many of his show’s segments, not just in his interviews. Colbert’s recurring series “The Craziest F#?king Thing I’ve Ever Heard” is often about interesting new scientific discoveries. He has discussed neuroscience, insect reproduction, and the Large Hadron Collider. He put the scientific Journal of Paleolimnology “on notice” for proposing an explanation for walking on water that differed from the biblical account. As a big fan of The Colbert Report, and as someone who drove 600 miles to attend the Rally to Restore Sanity and/or Fear in Washington, D.C., I wish Stephen Colbert the best as he prepares for this new phase in his career. I just hope that when it comes to covering scientific topics, CBS lets him keep up the good work.